If there was ever a food that I can associate with my grandmother, it would be broccoli rabe. 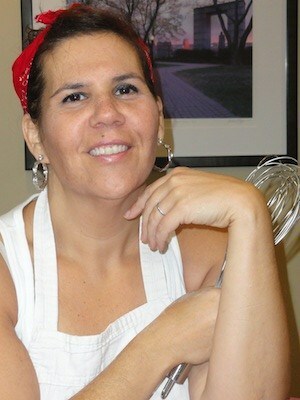 I remember walking into her kitchen as a child and the smell of the broccoli rabe cooking on the stove top would just stop you in your tracks. It was such a distinctive smell and you knew immediate what she was making. The aroma of garlic and greens cooking in olive oil is like no other. It is a dish that represents so much more to me than just food on a plate- it is a symbolic representation of her love, our family and my Italian heritage all in one. Yes, Italians do get that caught up in our food. We are such a quirky breed, but honestly I wouldn’t have it any other way. My grandmother would cook these greens simply, with garlic and oil and a pinch of crushed red pepper. A slice of crusty Italian bread was the perfect accompaniment. It was peasant cooking at its finest; so delicious and unpretentious. My big brother went wild for these bitter greens, he devoured them by the bowl full. I will confess that I kind of liked them as a kid-but I didn’t love them like my brother did. I did eat my fare share, but I could take them or leave them. My husband never had broccoli rabe growing up. So I began to make this dish for him when we got married, he instantly became a fan. I started to experiment with it, I wanted to see what else I could do with besides just sautéing them in garlic and oil. I began pairing them with different dried pasta and meat combinations. Broccoli rabe marries so nicely with Italian Sausage. There is something about the pork, the fennel (sausage spices) and the bitter greens that really makes this a lovely combination. I recently stumbled upon something in my quest to try new broccoli rabe dishes. Saveur Magazine featured Pulled Pork Italiano, a recipe based on a famous sandwich from a Philadelphia eatery. Picture this vision: slow roasted Italian spiced pork topped with sharp provolone cheese, garlic fried broccoli rabe on a crusty Italian roll. I have made this dish several times already. 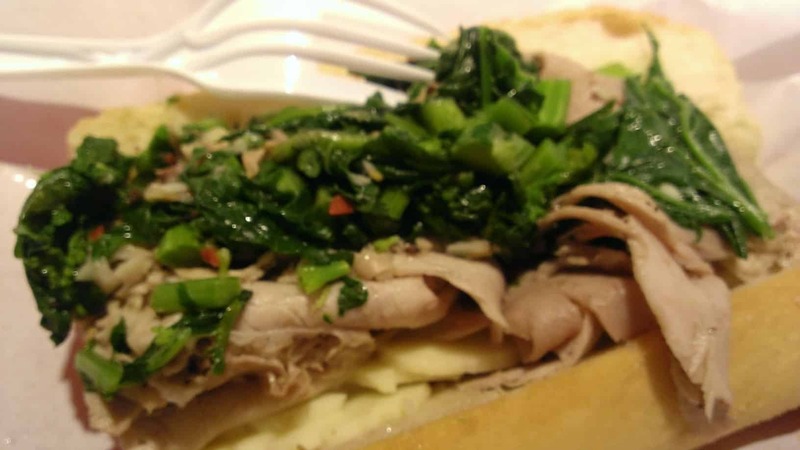 The combination of slow cooked pork, greens and sharp provolone cheese is absolutely amazing. I like that I can make it in a crock pot as well as the oven. It is perfect dish for parties because it feeds a large number of people. I make it in the spring and summer when you can get broccoli rabe fresh from the farmer’s markets. But honestly, this is a great dish anytime of the year, as long as you can get your hands on the greens. As a side note, I made a trip to this original eatery in Philadelphia last year and had their version of this sandwich. It was a real treat, a food highlight of my trip. This homemade version is definitely as delicious and worth all of the effort. If you like broccoli rabe and want to eat it in a new and delicious way, I highly recommend making this recipe. I played around with this recipe and made it in the crock pot. I followed the directions and cooked a 4-5 lbs roast in the crock pot until the pork was fork tender. Approximate cooking time is about 6 to 8 hours on high or 8 to 10 hours on low. 1. Heat oven to 450°. Combine fennel, parsley, thyme, and 3 tsp. chile flakes in a small bowl; set aside. Open pork shoulder on a work surface, and spread with half of herb mixture, rosemary, ¼ of the chopped garlic, salt, and pepper. Roll up shoulder, tie with kitchen twine at 1″ intervals to secure, and season out-side with remaining herb mixture, salt, and pepper. Transfer to a roasting pan and roast until browned, about 40 minutes. Remove pan from oven, and heat broiler. Add remaining garlic to pan, along with stock, wine, onion, and bay leaf; pour tomatoes over top and sides of pork shoulder. Broil until tomatoes are caramelized, about 20 minutes. Reduce oven temperature to 325°, cover pork with parchment paper, and cover roasting pan with aluminum foil. Cook until internal temperature of pork reaches 165°, about 2 hours. Set aside to cool. 2. Transfer pork to cutting board, and remove bay leaf from pan. Transfer juices to a blender and purée; transfer to a 4-qt. saucepan and keep warm. 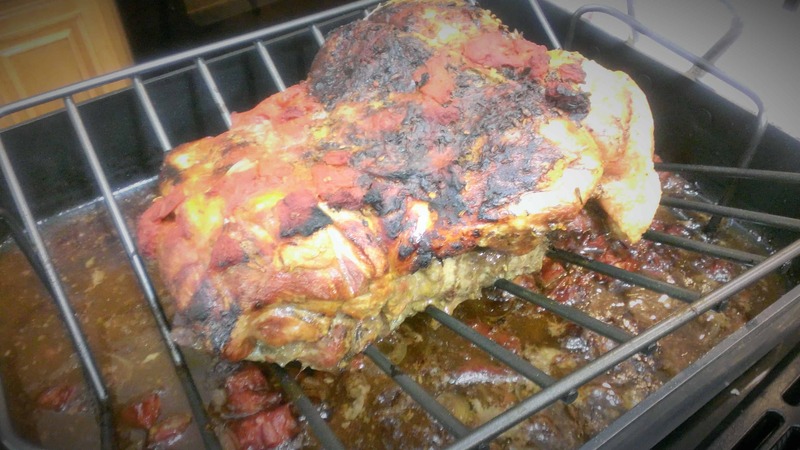 Pull pork apart into large pieces and add to pan juices. 3. Meanwhile, bring a large pot of salted water to a boil, and add broccoli rabe. Cook, stirring, until just tender, 2–3 minutes. Drain and transfer to a bowl of ice water to cool. Drain, and dry thoroughly with paper towels. Heat oil in a 12″ skillet. Working in batches if necessary, add remaining chili flakes and broccoli rabe and cook, stirring, until crisp and warmed through, about 4 minutes. Set aside. 4. Place 4 slices provolone on bottom half of each roll, and top with pork. Add broccoli rabe and peppers.